I was tempted to entitle this post, “Why Snack Girl Loves This Cupcake”, because salad puts people to sleep. zzzzz. Cupcakes on the other hand drive tons of people to this website. Sometimes, I wish I was a cupcake blogger. Alas, I am stuck with salad. This salad is a good one to be stuck with. Why? It gets better in your refrigerator over time (unlike lettuce). All the ingredients can be stored in your pantry or fridge for a while (also unlike lettuce). I grate my carrots in the food processor so it takes mere minutes to put together. Then, I put it on a shelf in my refrigerator where I can see it when I open the door. You want the healthy stuff right at eye level and the bacon somewhere in the back. Do not be afraid of ground cumin. It is the spice that brings the sweet carrots, raisins, and chickpeas together. Serve this as a side or add peanuts, avocado, grilled meat, or whatever else you have hanging out in your fridge to make a more substantial meal. What are your favorite salads that keep in your fridge? Sounds quite delicious. Another Snack Girl recipe I must try. I roast a chicken at the beginning of the week and shred it. I keep it on the top shelf of my fridge alongside all my veggies. Easy to grab everything and make a yummy salad. I confess that I have never had a salad with these ingredients before and the bacon is at eye level....right in front. But as I love hummus and carrots and don't mind cumin, I would love to try this salad. Adding shredded chicken sounds yummy as well! Thanks! This sounds great! I like the idea of adding shredded chicken sounds good to. My summer go to salad is sliced cucumber with rice vinegar. It's supposed to last a few days in the 'fridge but it never does in my house. I like this as a salad idea. However, I question this for nutritional equivalence. Two slices of my light, multi-grain bread give me more fiber, more protein, less sugar, less fat, and fewer calories than this carrot salad recipe. To really bring out the benefit of this "salad," I'd like to see something about the vitamin content or other nutritional benefits. I would try it too -- I love one with carrots, raisins, pineapple and Greek or plain yogurt. My other favorite marinated salads are tomatoes, cucumbers, and a little red onion, with red wine vinegar and olive oil (or Italian dressing), or tomatoes, black olives and mushrooms in a similar dressing -- mmmmm! Perfect! I have chickpeas cooking in my crockpot right now! @Mark- one reason why folks might want to eat real, whole food (e.g., carrots) instead of processed items (e.g., bread) is because of the vitamins, minerals, antioxidants, and other micronutrients present in the former and less so in the latter. While I'm not terribly fond of its proprietary nature, Whole Foods posts ANDI scores (http://www.wholefoodsmarket.com/healthy-eating/health-starts-here/resources-and-tools/top-ten-andi-scores) for many of their foods. Basically ANDI scores are a rating of how many micronutrients are crammed into (or lacking in) a particular food. I'm unsurprised that "light, multi-grain bread" isn't anywhere near the top of this list and that carrots are #6 in the non-green vegetables list. Michael Pollan is a well-respected science writer and a comment he's made is that if mechanical teeth were involved in something's production on its way to your plate, it's probably not as good for us as foods we eat using our own teeth. IMO, the process of making flour -- whole-grain or not -- involves a lot more mechanical teeth than a carrot grater. While fiber, protein, sugar, fat, and calories can certainly be part of the healthy-eating equation, you might want to keep micronutrients in mind since it seems that our bodies need a high quantity and quality of those. I agree with Andy. Another reason for not having bread (which I do eat - preferably whole grain or sprouted grain) is if you are watching your daily grains intake. I try to have no more than 3 grain servings per day, therefore, I need a broad range of food options to provide the nutrients and calories I need each day. Salads like this one are perfect to include in one's diet! I remember about a year ago I read this article written by an American who moved to France with her young children. She discussed how the French kids at a very young age LOVE their vegetables and why. The French make lunch their most important meal of the day and this holds true even in the school system. Lunch is served like a restaurant setting to the kids, and their veggie is served as a first course. 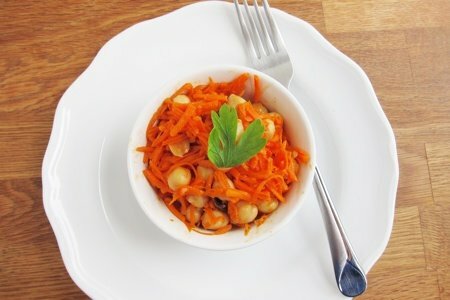 (like salad would be served as a first course here) So her family adapted to this way of serving and this carrot salad recipe was very common and kids loved it. So I tried this at home a few times with great success. I served this salad as a starter in a small glass bowl to fancy things up one night to my 3 kids under the age of 5. They ate all of it...probably because they were the most hungry. So this is a great way to get your kids to eat more veggies! I made it today and it's good but I used one small container of pineapple with juice (the kind that comes four little plastic tubs to a package) instead of oil. Colleen wrote: "...their veggie is served as a first course. (like salad would be served as a first course here) ... They ate all of it...probably because they were the most hungry. So this is a great way to get your kids to eat more veggies!" I love this recipe! Chickpeas are one of my favorites and I often put a handful in my green salads. I always have all these ingredients on hand. Raisins are tricky for us as diabetics as they raise our blood sugar very high instantly but I love the golden raisins the most. I can't wait to try this and go easy on the raisins. Thanks for a winner! @Robin- my wife has made a black-bean-corn-pepper-onion salad like that for a decade or more and it's awesome and you're right; it keeps for a while (and I think it gets better with age!). We used to "eat" green smoothies at lunch every day, but I realized that the "this is how we get lots of greens" claim was ignoring that we were also getting lots of extra fruit (which we don't have trouble getting) plus, we were using the blender's mechanical teeth instead of our own. A few weeks ago, I decided to switch off the blender and make us big ol' spinach salads every day. Takes a good 15-20 minutes to work our way through our bowls, but it ends up being about the same amount of leafy greens as we were getting via green smoothies without all that extra fruit just to make the liquid greens palatable. Just added this to my recipe file and menu for the week! As a single person this is a great salad for its long-lasting storage and nutritional punch, a great topping to vary my daily green salad! I especially enjoy all the useful and inspiring comments from your readers [Andy and Colleen], the ANDI scoring was news to me and the french eating style is very wise, no wonder the French aren't suffering from an obesity epidemic like the US. I always started our family dinners either with salad or a cup of my veg soup [even tho my 2kids were not picky eaters]. This year my garden runneth over with italian green beans and juicy tomatoes, so I made cut green beans/red onion/chickpea/ celery salad marinated with a bit of o/v and oregano, s/p in my qt Ball jar. Sometimes I used red kidney or black beans. My son always takes some on his plane trips back to Nashville and my macrobiotic daughter just attacks these types of salads when she visits. Another veg we eat frequently in salads or as snacks is a simple salt pickle--wedges of pickling cukes with crushed garlic and salt water in Ball jars, they keep for about 2 weeks and are sooo crunchy delicious. Thank you Snack-girl for another useful post!!! @AndyD: I disagree with many of your comments. I don't put a whole lot of credence in ANDI because of some items it places on the bottom. Cashews and almonds are staples of my diet. They are a key means to getting the calories I need in [what I believe is] a healthy way. I prefer foods with a high non-saturated fat to saturated fat ratio than vice versa. The multi-grain bread I mentioned has 80 calories per two slices along with roughly 4g protein and 6g fiber. That's not junk nor is it worthy of the negative connotation offered by the adjectives "processed" or "refined." For my diet, I track at least 14 different categories of macro- and micronutrients. What is of high value to me are the jigsaw pieces that fill critical needs. The bread I mentioned does well to contribute protein and fiber without a lot of calories. The salad here contributes some vitamin A, some (less) fiber, some (less) protein, and some (more healthy than not) fat. That was my comparison. Macronutrients are of critical importance for well-balanced nutrition. Micronutrients are also of critical importance but they are much more difficult to quantify. Feel free to provide me some references drawing a positive correlation between high ANDI and decreased mortality/morbidity. The comment about "mechanical teeth" seems anecdotal. Has Pollan done the science? One method might be a large enough random sampling of foods to be adequately powered in each category. Some correlation could then be done with different wellness endpoints. That sounds pretty involved to me. All that aside, if your eating bread instead of carrot salad helps you meet your dietary/health goals, don't let me or anyone else here talk you out of it! My takeaway from every single one of Lisa's posts is this: If X works for you (and your "[nuts] are a key means to getting the calories I need in [what I believe is] a healthy way" comment seems to allow for different people having different opinions and different paths), go for it! I may have misinterpreted your reply, but it seemed like you asked Lisa to explain something, I took a stab at it, my answer wasn't to your satisfaction, so maybe you really didn't want an answer that was different than your current belief? Any recipe that incorporates veggies instead of process foods (bread) is good in my book. Andy I love my Vitamix because even though I try to eat as many salads as I can, this helps, especially with kale has I find it easier to drink then it. I love reading all your comments. After reading the Chine Study,for me whole food living is the best. I can only say how I feel eating these foods and cutting out the junk. I feel so much better and it shows on my skin. It may not be for everyone (my husband included, which I'm slowly bringing him around) to but I can only speak for myself that the more I read up on the latest specific facts the more I'm happy with my choice. @Andy--I did not claim that "[bread] is NOT processed." Your argument that "I think humans and proto-humans got along just fine without it for many millennia and can continue to get along without it" is practically cliché nowadays. That doesn't make it useful. Maybe you could get along without it but that doesn't make it ideal. With it, your overall nutrition may be enhanced or better. I aim for the latter. "In my view, Snack Girl... will get a lot of agreement that foods, er, 'foods' that are more highly processed are less healthy." I don't disagree with that but you need to analyze on a case-by-case basis. What is "highly processed" is often a matter of opinion and quality of nutrition is an altogether different issue. Bread probably doesn't deserve all the bad press it gets (e.g. http://www.caloriesecrets.net/is-bread-bad-for-you-and-how-much-is-too-much/ ). The bread I mentioned is low in carbs, high in fiber, high in protein, low in fat, and low in sugar. I didn't ask Lisa anything in my original post. I suggested a better representation of nutritional benefit--something that may or may not be quantifiable. If I wanted to make this oil free I would use a tablespoon of chia gel? It sounds SO good! @Mark- I'm sorry that I misread your original post as having asked something on which you were seeking input (from Lisa or anyone else).